Here’s a fun idea for the Valentine who doesn’t want to add any pounds with her chocolate treats…. 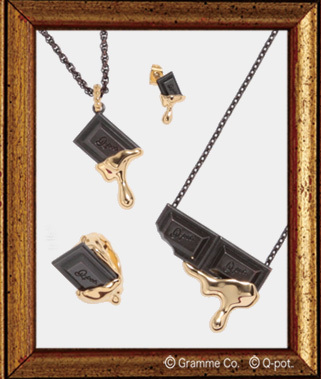 Japanese Positive Accessory Brand “Q-pot.” recently announced the launch of a new accessories line, “Melty Chocolate”, designed to look like a delicious melting chocolate bar. "Melty Chocolate" pnedant, ring and earring. Available at the QPot store in Ala Moana Center, mall level. Priced from $70 – $211. This entry was posted in Hawaii Fashion, Shopping, Uncategorized and tagged Ala Moana Center, QPot. Bookmark the permalink.